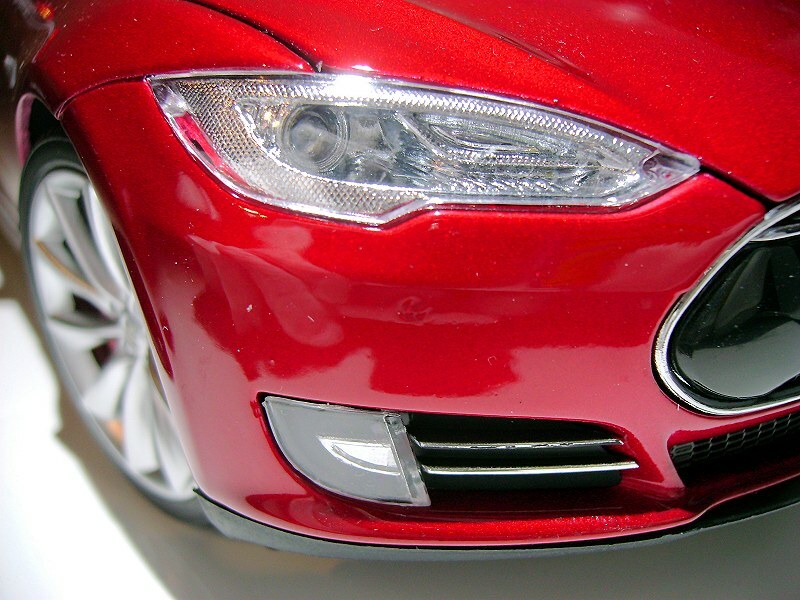 That the combustion engine is not exactly eco-friendly and fossil-fuel-resources are limited has been a well-known fact for quite a while now. But established car manufacturers have since worked on attractive daily drivers propelled by alternative energy rather half-heartedly. Almost 30 years after John Z. DeLorean´s failure to make an “ethical”, sustainable and attractive car, an automotive American Dream has come true that beats the economically stronger competition hands down. 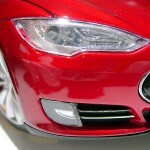 The Tesla Model S does not only look sleek and elegant like a Jaguar or an Aston Martin, the seven-seater sedan also has a ludicrous acceleration: in 2.8 seconds it accelerates faster than a Lamborghini Aventador and you need a 1000 hp Bugatti Veyron or a V10-powered non-road-legal lightweight like the Sesto Elemento to beat the luxury sedan in this discipline. 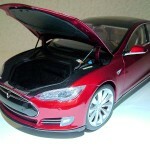 Even for top speeds of over 150 mph Tesla´s top version has enough juice in its laptop batteries across its floor tray. However, those hot laps cost dearly in terms of the 360 mile-range reached when driven gently. Not even the recuperation during rolling helps then and the Tesla has to “refill” for half an hour at one of the ever-growing web of Superchargers before it runs out of juice. 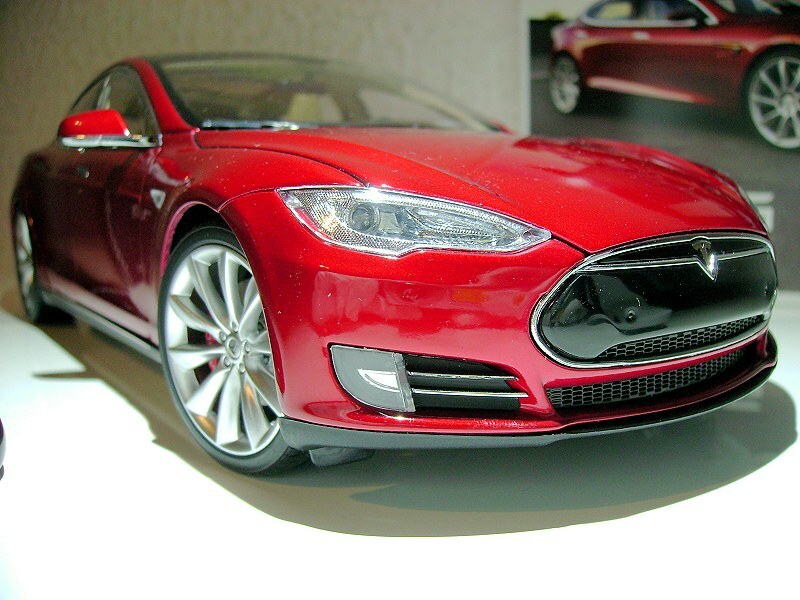 The 1:18 Model S has been developed by Tesla themselves and is sold exclusively through its own lifestyle shop and dealerships. 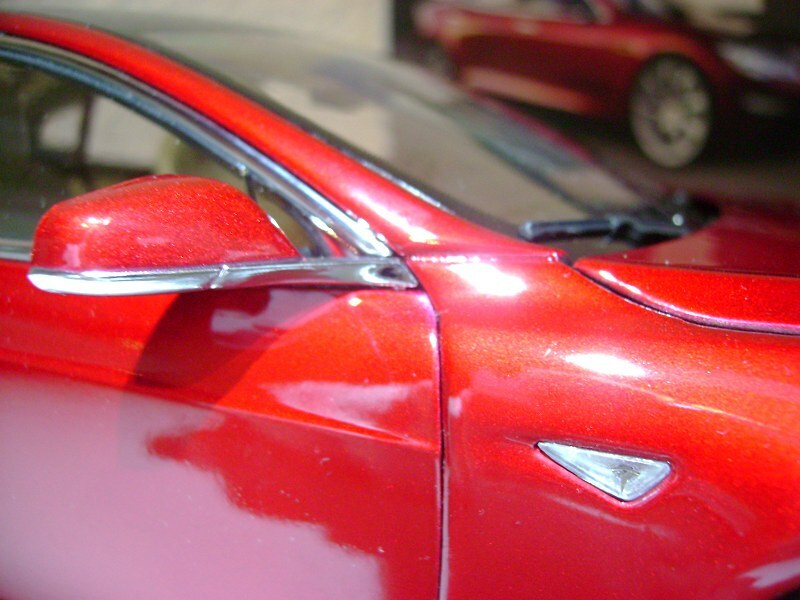 The 270-parts-model is either available in Midnight Silver Metallic with dark rims and black interior or in dark red multi-coat-finish with bright turbine-alloys and bright interior as shown here. 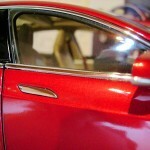 The metallic paint job is a job mostly well done: The paint glistens with its fine flakes. 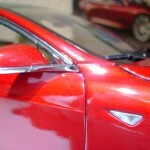 My model only has a minor sand-grain-sized chip on the hood, two other minor blemishes. 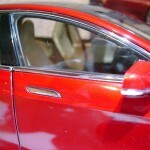 Chrome accents like the window frames, the retractable door handles, at the trunk or around the front area are fine and shiny. 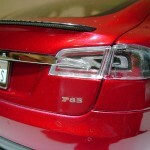 Tesla logos and badges are photo-etched and glued on. 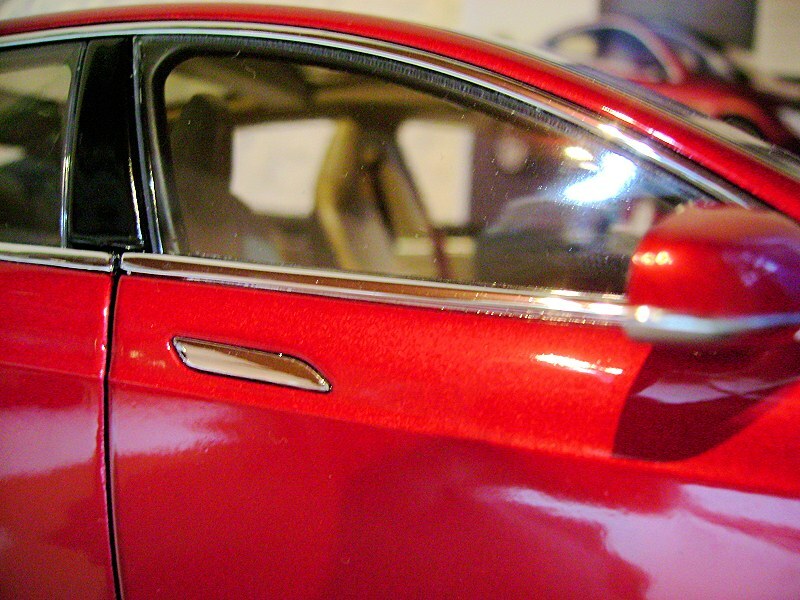 Even in the quarter-lights a tiny Tesla-T becomes visible upon close inspection. 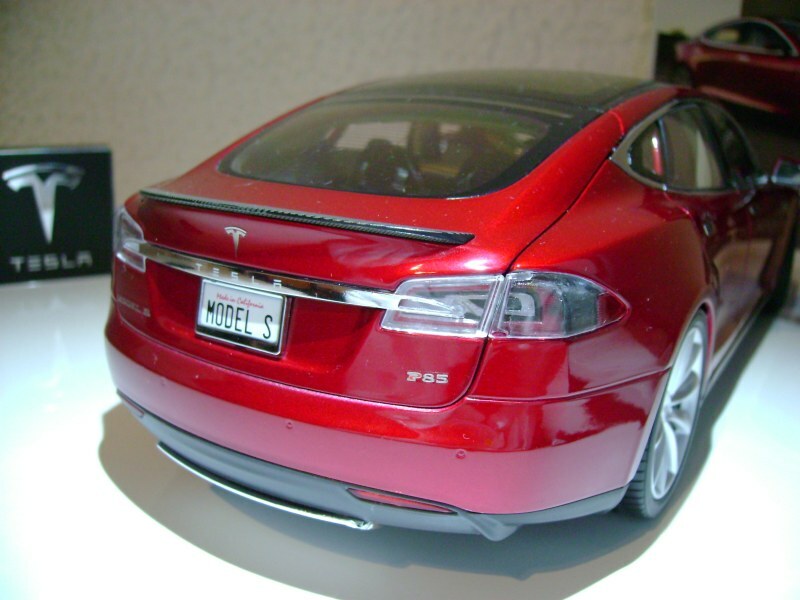 The rear spoiler´s imitation-carbon nicely contrasts with the red paint´s glow. Behind the clear lenses of the taillights structured and painted-coated silver-plastic creates a convincing effect, whereas the headlamps´ interior cannot keep up with that. 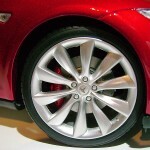 The rims nicely replicate the turbine design and shine in a matte alloy color. 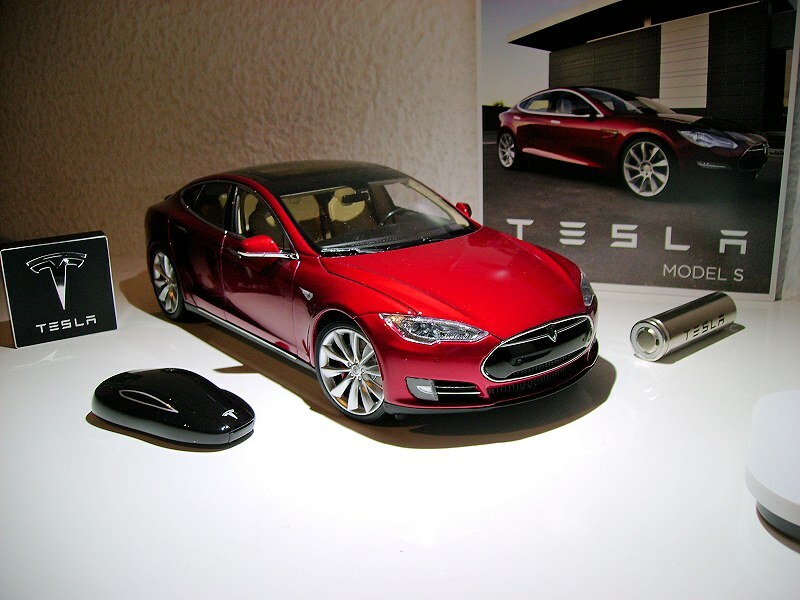 The wheel nuts around the photo-etched Tesla-T ant the wheels´ centre are well done, but not as pronounced as on a Kyosho or an AUTOart. 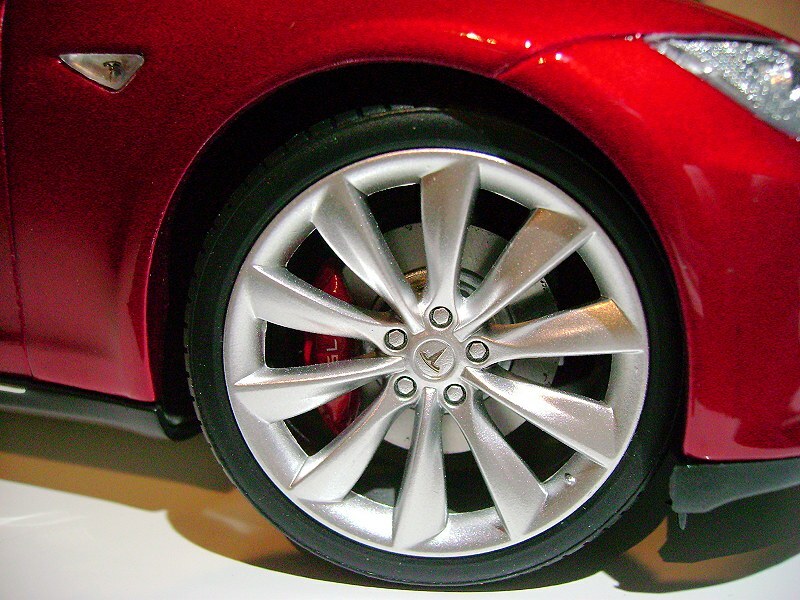 The brake disks are rather flat silver with red brake calipers which bear the Tesla name. Tight shut-lines keep the doors shut tightly, but the panoramic glass roof gives you an entirely sufficient glance at the interior. 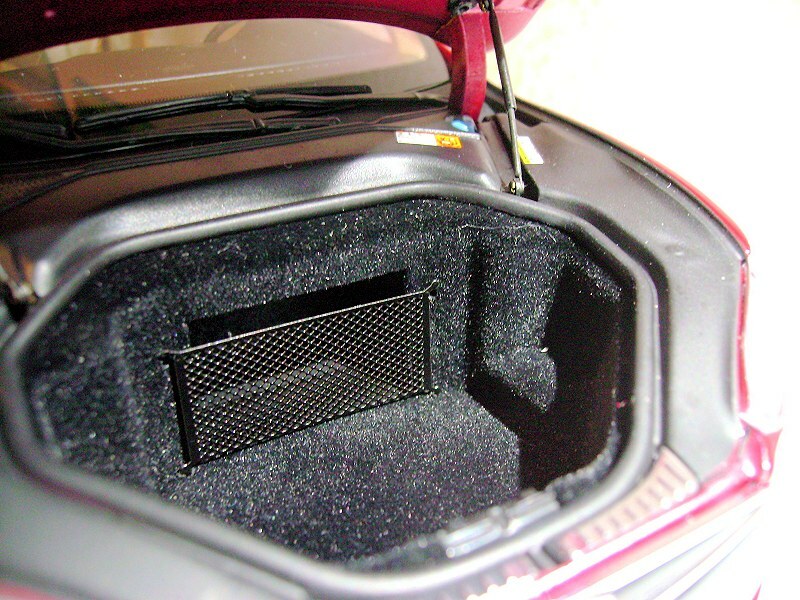 Like the original the carpeted interior has a functional simplicity to it. The seats´ surfaces look rather flat and shiny, the wood veneer has been printed on convincingly in hi-res, but, unfortunately, the air-vents have also received the same treatment. 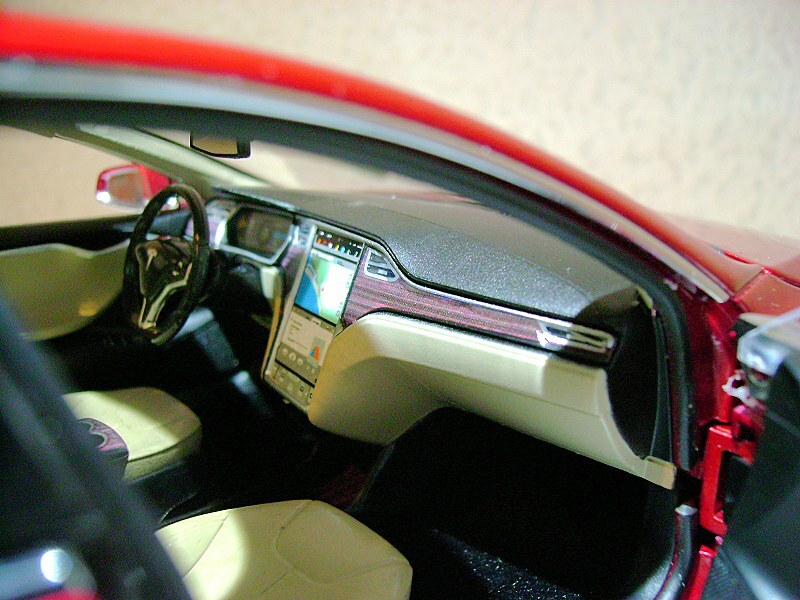 That the famous giant touchscreen in the centre-console, which controls almost each and every function of the car and replaces almost all the buttons, is just as flat lies in its very nature. 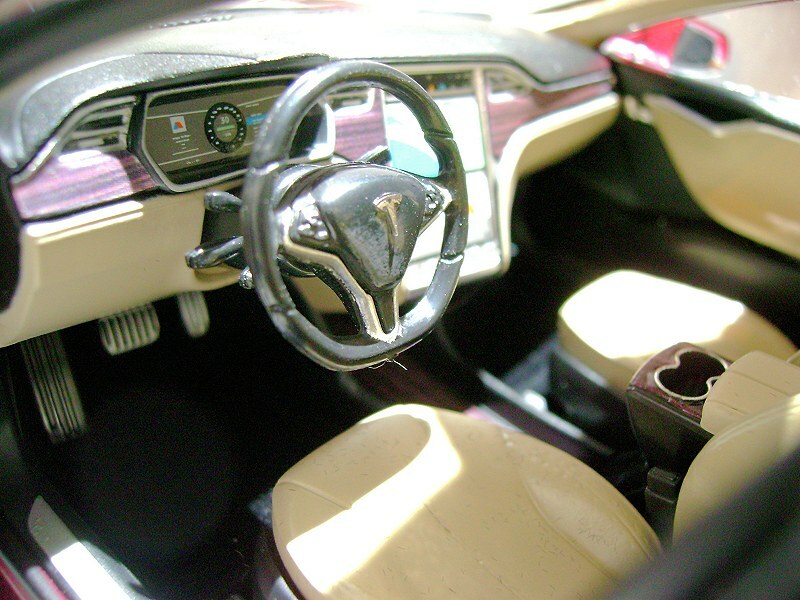 The same goes for the LED instrument panel behind the steering-wheel which, I am sorry to say, looks regrettably cheap. The pedals, by contrast, look surprisingly good. Of course all of the five seats for adults have textile seatbelts with photo-etched buckles. 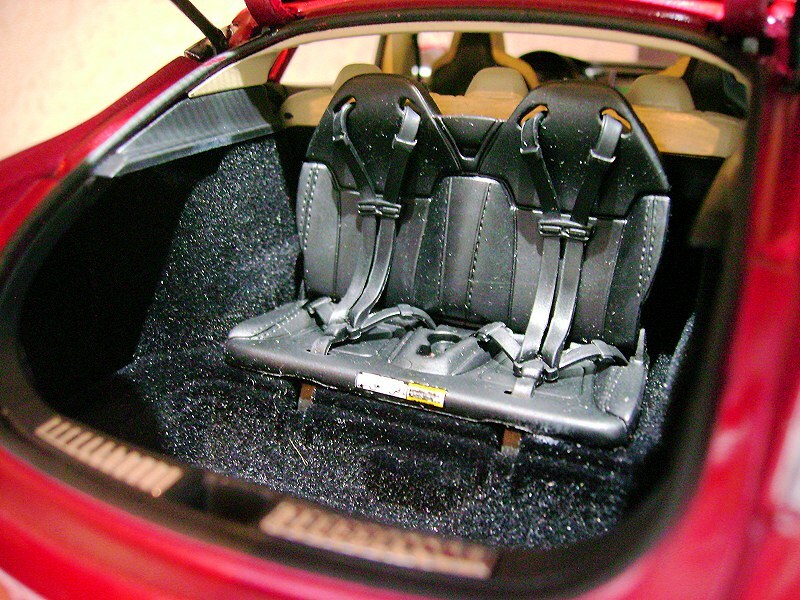 The optional seats in the trunk, though, including their harness-seatbelts to strap in the kids have been replicated in moulded black rubber. 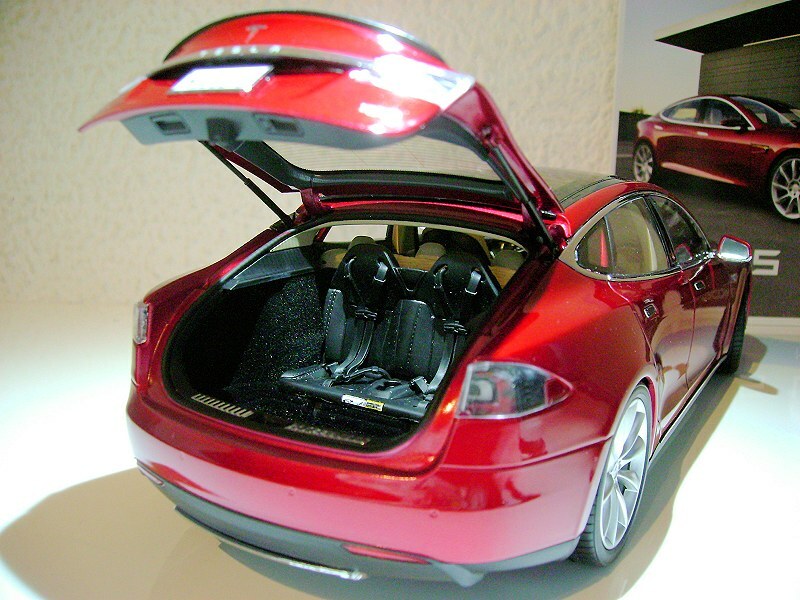 The telescope struts supporting the hatchback-style trunk-lid raise more enthusiasm. 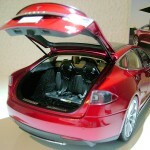 Tesla´s famous FRUNK (contraction of “FRont tRUNK”, in case you haven´t heard the term before), just where you´d find a combustion engine in ordinary cars, opens on struts, too, and reveals another carpeted space for luggage complete with a photo-etched net-replica and the only lid for liquids to be found on the all-electric vehicle: for windshield-cleaning-fluids. Anyone who´d like to own this Burago-scaled replica of an undoubted milestone in automotive history will have to pay AUTOart/Kyosho money, sadly not at quite the same quality, though. As to who makes this replica, my best guess is that from its immense weight and the way the rims and lights are made, I´d say it is made by CSM who have also made the Lancer Evolution X for Mitsubishi. 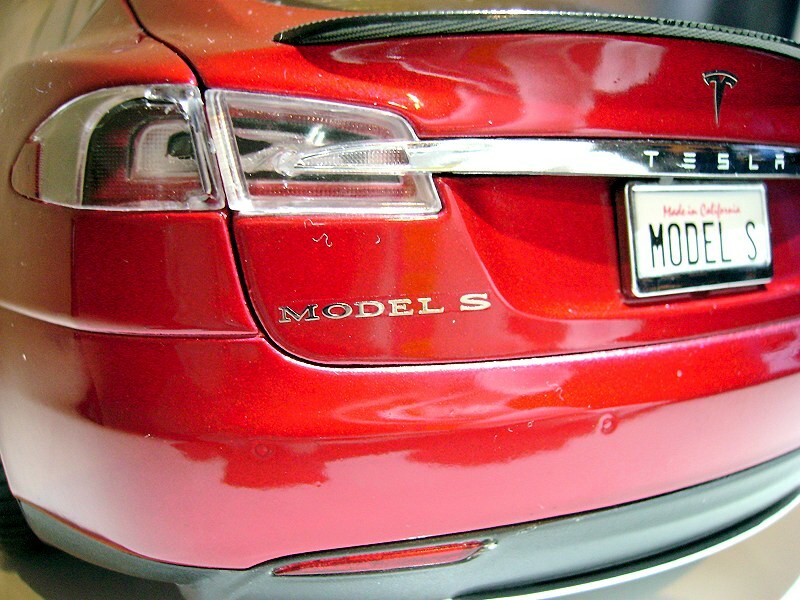 The value of the model is somewhat increased by its rarity. At least here in Europe it is in extremely short supply. 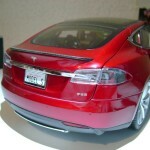 4 Responses to "REVIEW: CSM Tesla Model S"
Karsten great review as usual, though I don’t agree with the Burago comparison. I think is more like Norev, maybe slightly better. I’d like to add one myself, but based on current going rate I’m going to pass. Thank you. The Burago comparison only refers to the 1/18 scale which was originally invented by Burago. If it can be misunderstood, please change it. 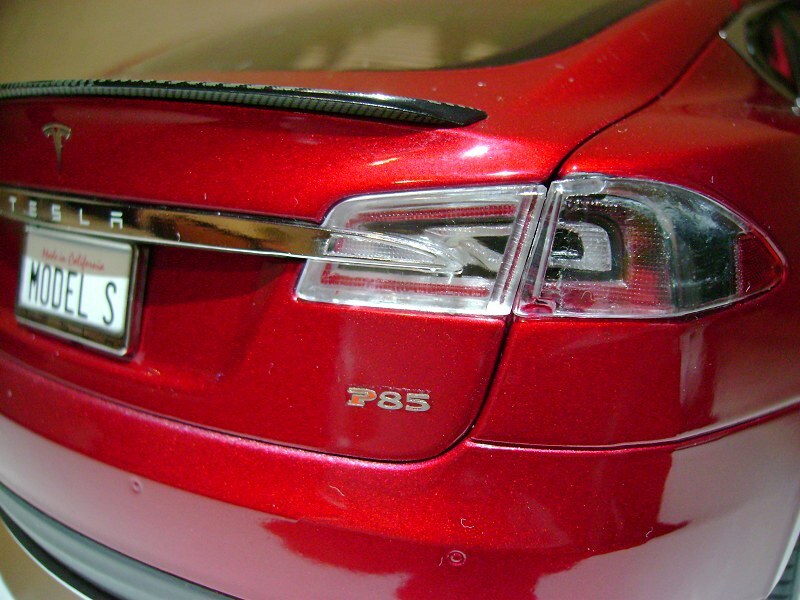 I did not mean to liken the Tesla to Burago quality-wise. I even consider it better than Norev, but not quite up to Kyosho or AUTOart. 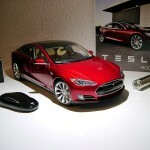 That´s why CSM is my best guess as to who Tesla´s partner might be. 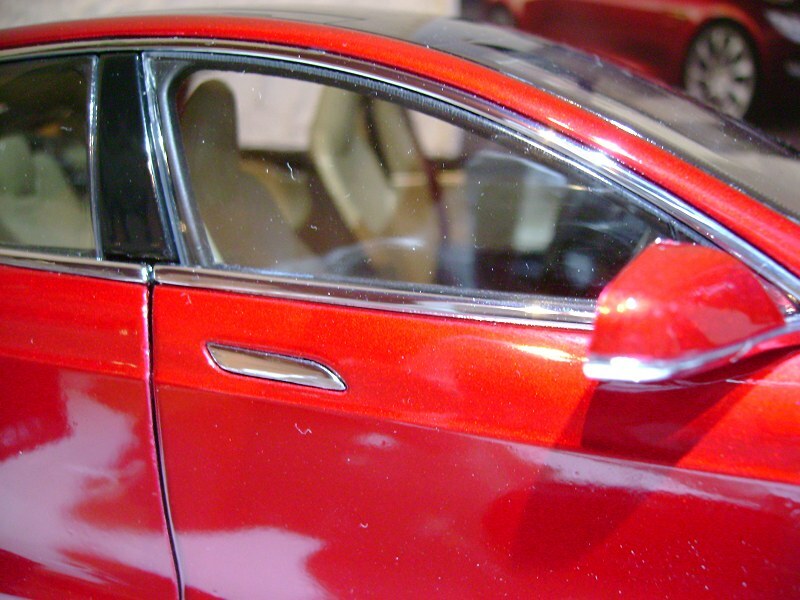 one of the managers where I work has a Tesla P85D and he has this very model on his desk at work and I have had a hands on look at it and I have to say the overall finish and details are quite disappointing considering the money they demand. I do really like the real car and was looking forward to the day a model was available seeing I cant afford the real thing but this model is a complete let down.. Hopefully AUTOart gets a chance to make their own version in Signature series and I’ll buy that instead! 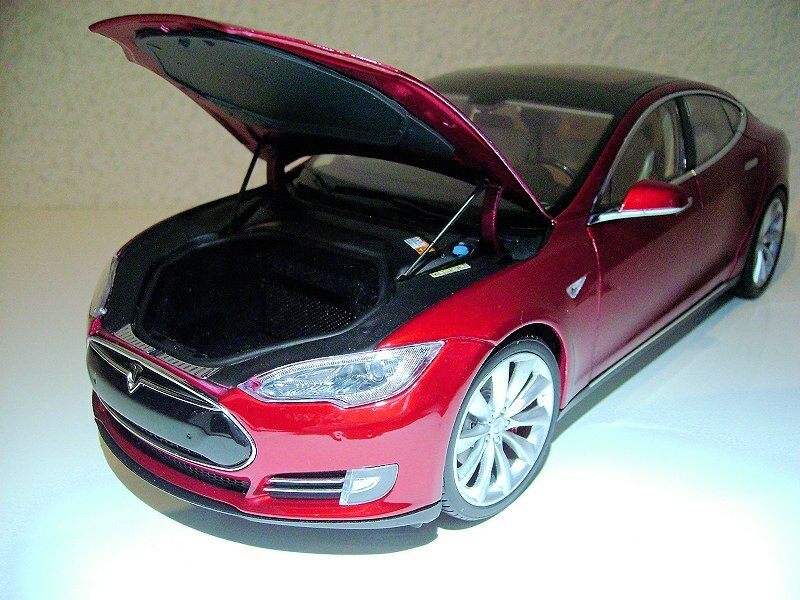 1/18 TESLA SUPERCHARGER now available to accompany this model from Shapeways.